Our certificate program offers students the opportunity to delve deeper into the challenging world of leadership and change making. By pursuing the Boreas Leadership Certificate, students build on the skills and networks developed in Boreas programming and practice leadership through a leadership project. Students completing the requirements receive a printed certificate, are recognized on the Boreas website, and may reference the accomplishment on their resume or CV. Like other Boreas programming, the certificate is offered at no cost. Make an effort to regularly attend Boreas networking events. 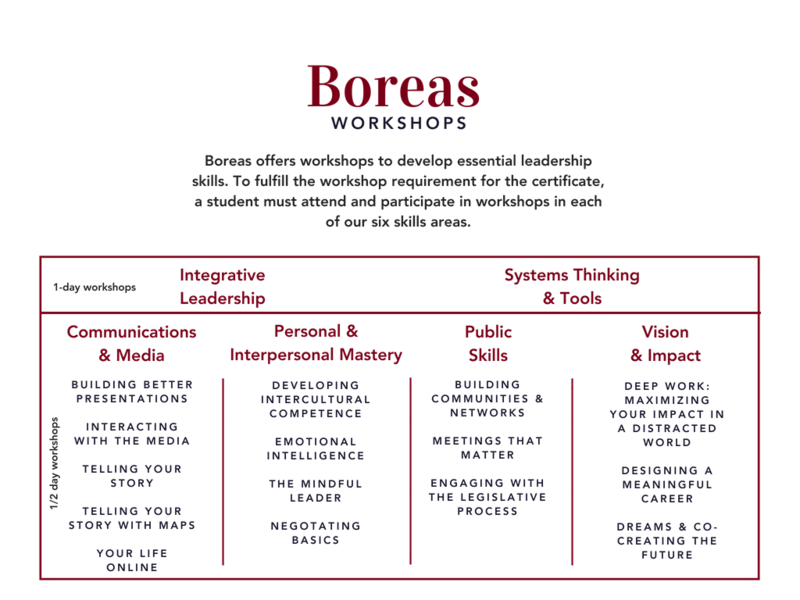 To earn a Boreas Leadership Certificate, students must also complete a Boreas project. The project must go beyond what is required in your graduate program and should draw on skills learned in Boreas short courses and workshops. Projects must be approved by the Boreas program staff before significant work has begun on the project (see the project approval form below). Group projects are encouraged but not required. Stephen Brennan is pursuing his Master’s degree in Integrated Behavioral Health. For his certificate project, Stephen facilitated a 12-week trauma skills group for clients with co-current post-traumatic stress and substance use disorders. As a result of the positive feedback received of the initial 12-week pilot program, the host organization has committed to continue to offer this training to their clients (Feb. 2018). Reba Juetten is a Ph.D. candidate in the History of Science, Technology, and Medicine program. She completed her Boreas certificate project by managing the Boreas Twitter account for a semester and developing a rotating list of hosts from Boreas leaders past and present each of whom hosted the account for a week. She has found the Boreas Graduate Leadership Program to be an immensely enriching experience including its leadership opportunities for members of the advisory team, the practical skills taught in its many workshops, and the networking opportunities with other engaged, inspired, and ambitious students (Dec. 2017). Diele Lobo is a graduate student in the Conservation Sciences program. She took what she learned from Boreas workshops and presented the Building Better Presentations workshop to 60 graduate students, post-docs and faculty members at two universities in Brazil (Sept. 2017). Melissa Aho completed her Boreas certificate project entitled, “Making Your Voice Heard”. As part of her project, she published this piece in Minn Post (May 2017).